← Embrace the change of life and your vision! Even though spring is officially upon us, it is COLD still where I live! And while I have been enjoying my green smoothies, I am still craving the warmth of a nice bowl of soup or stew. I started to flip through my cook books for some inspiration and I quickly fell in love with my YumUniverse cookbook by Heather Crosby. Her recipes are simple yet elegant and all plant based! 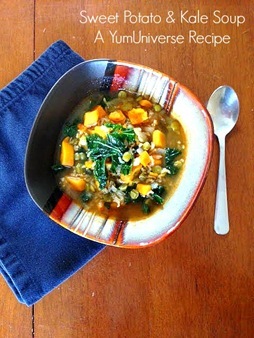 ❤ I have had her cook book for a few months now and decided on a Sweet Potato and Kale Stew… it did not disappoint! 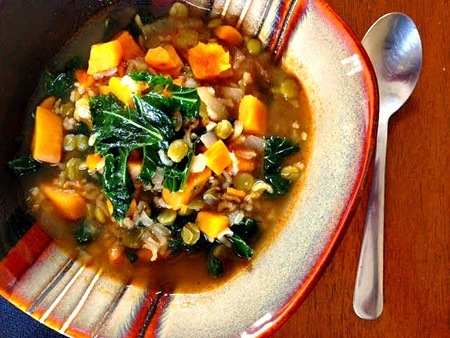 This soup is full of amazing flavor and nutrients – green kale, protein packed lentils, aromatic cumin and love! Because love is the best ingredient! You can view the full recipe over on Heather’s blog here. And please browse around! She has an amazing collection of plant based, grain free recipes that are all amazing! And if you LOVE her blog then you will LOOOOOOVE her cookbook! This entry was posted in recipe, soup, vegan, vegetarian. Bookmark the permalink.